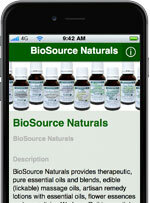 Essential oils for the Root Chakra (Sanskit Name Muladhara) Located at the base of spine. About the Root Chakra: Root chakra issues physically manifest as Anemia, fatigue, depression, lower back pain, sciatica. Emotionally presents as issues learning to stand up for oneself. Security issues and dealing with tasks in the material world. The color red adds vitality, courage and confidence. Use red gemstones, red oils, red food. Stimulated by physical exercise, restful sleep, pottery, gardening. Essential Oils for the Spleen Chakra (Sanskit Name Svadisthana) Located below navel, lower abdomen. Spleen Chakra issues physically manifest as eating disorders, alcohol and drug abuse, candida, depression, low back pain, urinary problems, sensuality issues. Emotionally presented as intimacy issues, inability to socialize, feeling disconnected to emotions and sensing abilities. The Spleen Chakra is stimulated by warm, aromatic baths, massage. Orange food. Orange gemstones, orange clothing. Essential Oils for the Solar Plexus Chakra (Sanskit name Manipura ) Located above the navel, stomach area. Spleen Chakra issues physically manifest as digestive issues, blood sugar issues, constipation, nervousness, parasites, poor memory. Emotionally presents as low self-confidence and inability to have self-control and humor. The Solar Plexus Chakra is stimulated by education, reading, sunlight, detoxification, sunshine. yellow food, yellow gemstones and clothing. Yellow essential oils for the Solar Plexus Chakra are helpful. Essential Oils for the Heart Chakra (Sanskit name Anahata ) Located at center of chest. 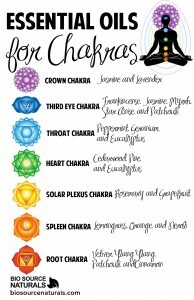 Heart Chakra issues physically manifest as breathing disorders, breast cancer, chest pain, high blood pressure, immune system problems, muscular tension. Emotionally Heart Chakra are issues with love, forgiveness, compassion, self-control, self-acceptance. The Heart Chakra is stimulated by nature walks, green food and beverage, time with friends and family. Green gemstones and clothing. Essential Oils for the Throat Chakra (Sanskit name Visuddha) Located at the throat. Throat Chakra issues physically manifest as thyroid imbalances, jaw, neck and shoulders problems, mood swings and hormonal issues. Emotionally Throat Chakra are issues are learning to express the true self, ability to trust, loyalty, organization and planning–either too much of not enough. The Throat Chakra is opened by singing, poetry, stamp or art collecting, meaningful conversations. Blue gemstones and clothing. Essential Oils for the Brow or Third Eye Chakra (Sanskit name Anja) Located in between the eyes and forehead. Brow or Third Eye Chakra issues physically manifests as learning disabilities, sleep disorders, depression. Emotionally, Brow or Third Eye Chakra issues are: the right to “see”, trusting one’s intuition and insights. Developing psychic abilities. Self-realization. Releasing hidden negative thoughts. The Brow or Third Eye Chakra is opened by mediation, star gazing, indigo food. Wearing indigo gemstones and clothing. Essential Oils for the Crown Chakra (Sanskit name Sahasrara) Located at the top of the head. The Crown Chakra issues physically manifests as headaches, light sensitivity, neuralgia. Emotionally Crown Chakra issues are: Dedication to the divine consciousness, spirituality, connection to God, Source or higher power. The Crown Chakra is opened by dreams, visions, and inventions. Stimulated by violet food and drink. Also, wear violet gemstones and clothing.